In this worksheet, students use their knowledge of plants and animals to decide what is true about them. We share the Earth with lots and lots of different plants and animals. As we grow we learn to tell plants from animals and then animals from different sorts of animals. How do we do that? We use their features, or something about the way they move or where they live. 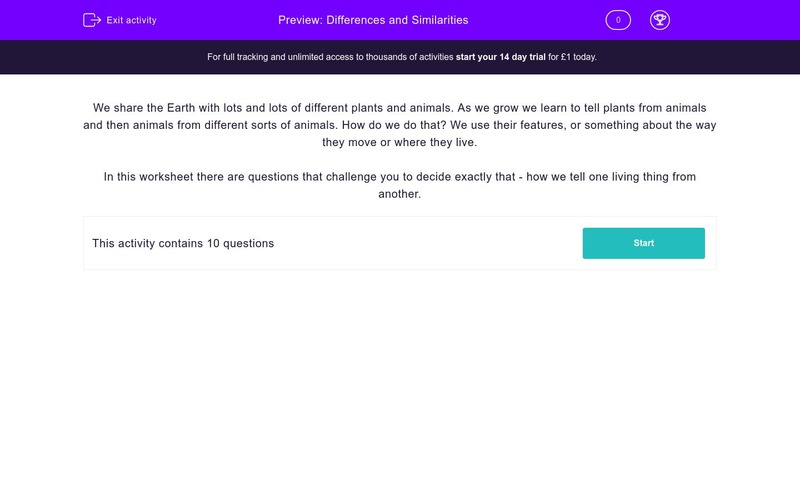 In this worksheet there are questions that challenge you to decide exactly that - how we tell one living thing from another. What is true about all birds? What makes fish different to birds? In what way is a whale like a fish? How is a dog like a mouse? How is a spider different from a fly? How is a snake similar to a fish? How is a caterpillar different to a worm? How is an eagle like a penguin? Plants are very much alive and they are mostly made of water, so the answer must be that they don't move fast. That's pretty much true - even fast-growing brambles would look really slow if you sat and watched them. However, some do move fast - like the 'snap' when a Venus flytrap catches an insect! Most birds can fly but many cannot, like ostrich, penguin, kiwi. Some eat worms but certainly not all, but they do all have feathers - that is what makes a bird, a bird! Both birds and fish generally have two eyes, so that can't be it and they both have a skeleton inside them. So the answer is that fish can breathe under water and birds cannot. Diving birds, like penguins, still have to come to the surface to breathe. Whales have smooth skin whereas fish have scales. Fish lay eggs but baby whales are born alive. However, both fish and whales live in water, although whales have to come to the surface to breathe. Most mammals have some sort of hair or fur, so that can't be it. While many animals have four legs, quite a lot use two - monkeys for example. But only humans just walk upright - some animals can do that (maybe even your dog) but only humans are designed to do so. Both dogs and mice are furry animals - they are called mammals. Their fur is important in keeping their bodies warm. Both are pretty small (compared to you!) and both have eyes, although they are different sorts. However, the fly is an insect and so has 6 legs. Spiders have 8 legs which is one of the reasons that people don't like them - as they scuttle across the floor on those 8 legs! Some snakes do live in water, but most don't and while snakes can be pretty wriggly most fish aren't. However, they both have a scaly skin. A fish's scales are separate to each other while a snake's scales are more part of its skin, except underneath where their scales help them to move along the ground. Some worms are tiny, some caterpillars are pretty big - so that's not right. Bright colour sounds right until you've seen a bright red worm! In fact it's legs - worms never have legs and since caterpillars are insects they have six stumpy little legs! Some eagles are black and white, but most aren't and no eagles live in the Antarctic. However, both eagles and penguins are birds, so they both have feathers, although penguin feathers are small compared to an eagle's.